Blast Onepiece wins this year’s Arima Kinen to claim his first G1 title. Third pick Blast Onepiece , the only three-year-old in the field, beat his senior G1 rivals in this year’s Arima Kinen to claim his first G1 title before a cheering crowd of over 100,000 fans. Breaking his maiden in his debut start in November last year, the Harbinger colt marked a three-race winning streak when winning the Mainichi Hai (G3) in March this year but finished fifth in the following Tokyo Yushun (Japanese Derby, G1) where he was posted second favorite. The three-year-old bay kicked off his fall season with a win in the Niigata Kinen (G3) and was posted race favorite in the Kikuka Sho (Japanese St. Leger, G1) but finished fourth. This win marked trainer Masahiro Otake’s first G1 title and tenth JRA grade-race win since opening his stable in 2009. This win also marked jockey Kenichi Ikezoe’s 24th JRA-G1 title following his Oka Sho (Japanese 1000 Guineas) win with Reine Minoru last year and a record-high fourth Arima Kinen title following his win with Dream Journey in 2009 and Orfevre in 2011 and 2013. Third pick Blast Onepiece, making a clean break from stall eight, traveled wide in mid-division, 6th or 7th from frontrunner Kiseki. 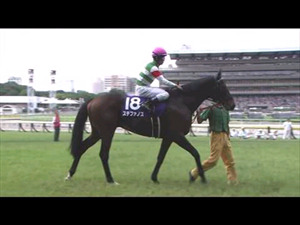 The son of Harbinger made an early bid from around 600 meters out, secured a clear path turning the last two corners wide and produced a blasting charge in the last uphill stretch, overtaking Kiseki less than 100 meters out and holding off the strong efforts by the race favorite, for his first G1 title. “As I had drawn a middle gate (8), I was a bit worried of being caught between horses so I settled him toward the outside. He ran well and though we were closed in by the race favorite at the end, he held on really well. I’ve been telling everyone that he is a G1 horse and I’m happy that I was able to prove it,” commented Kenichi Ikezoe. Race favorite Rey De Oro traveled wide, around ninth from the front, behind Blast Onepiece and threatened the eventual winner in the last stretch with a powerful late charge that timed the fastest last three furlongs of the field but was a neck short at the wire to finish second. Ninth choice Cheval Grand eased back towards the rear after breaking smoothly from stall 15 and eventually settled around 11th from the front, eyeing Rey de Oro on the left. 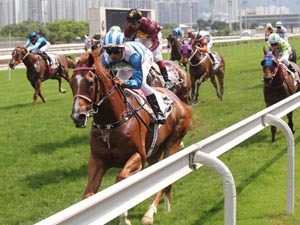 The son of Heart’s Cry ran persistently behind the race favorite after entering the lane, passing tiring rivals along the way, to secure third place. 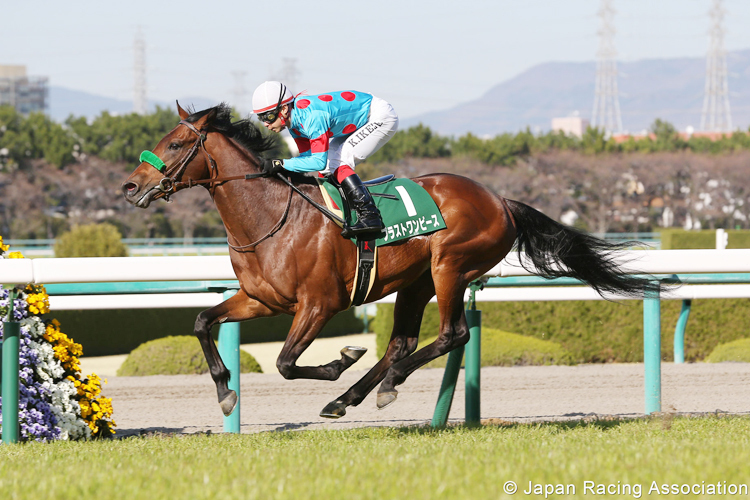 The 80th running of the Tenno Sho (Spring) will be held on Sunday, April 28th and it is a 3,200 meter outer turf event at Kyoto Racecourse.